In the sleepy town of Montpelier, Vermont, I found myself one Friday night in the midst of a local celebrity. I was attending a live performance at a small art gallery downtown, as part of the mid-May Art Walk. The band onstage was called Jaguar Stereo, and one of my good friends from Vermont College of Fine Arts was guest-starring, performing some of his poetry. Comprised of a double bass, a flute, a drummer, and a bass clarinetist, Jaguar Stereo doles out original, improvised jazz music with grace notes of electric poetry regularly around Montpelier and the surrounding area (listen to a sample of Jaguar Stereo’s work here). 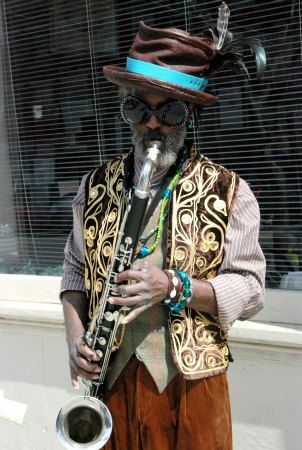 When my friend wasn’t reading, the bass clarinetist (and founder of the band) stepped up and crooned his own beats and rhymes and poetic lines. He was clad in a leopard spot vest, a handmade felt top hat and decadent turquoise jewelry. An iridescent butterfly clip nested atop his salt & pepper beard. I soon learned his name was Toussaint St. Negritude and I knew I had to meet him. 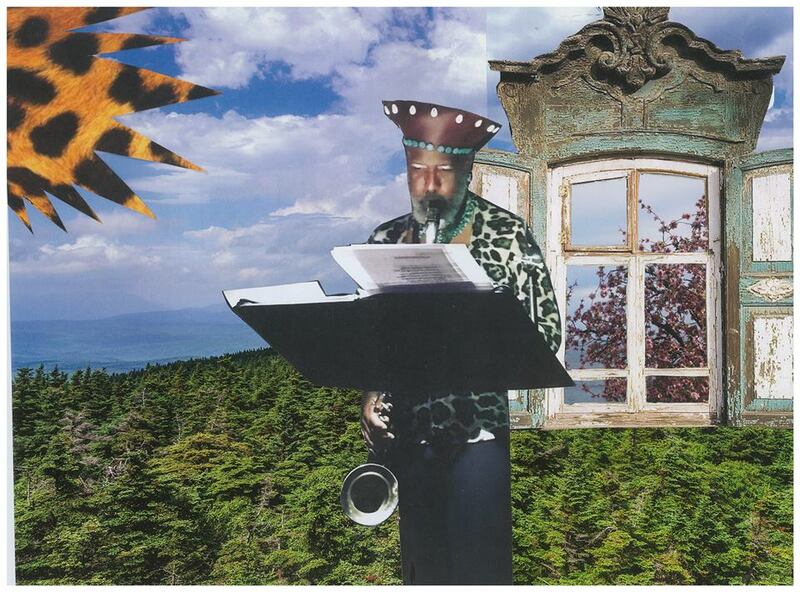 Born as Orson Titus, Toussaint St. Negritude is the kind of man that everyone in town knows; likewise, he knows everyone. When he’s not performing his poetry or composing music for Jaguar Stereo, Toussaint works at the local coffee shop. 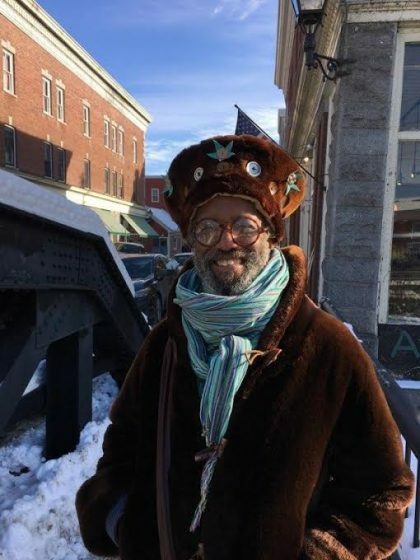 He served as the first Black Poet Laureate in Belfast, Maine from 2015-2017, and has been living in Vermont ever since. His publications include the poetry collection, Upheave (Trenchant Fist Press, 2014), as well as poems featured in the I’ve Known Rivers Project, SOMA Magazine, The San Francisco Bay Guardian, Philadelphia Stories, Savannah Literary Journal, Birchsong: Poetry Centered in Vermont, and elsewhere. One balmy mid-May night after finishing an afternoon shift at the nearby Capitol Grounds cafe, Toussaint made time to meet me for a long, winding chat on the lawn of the gold-domed Vermont State Capitol. 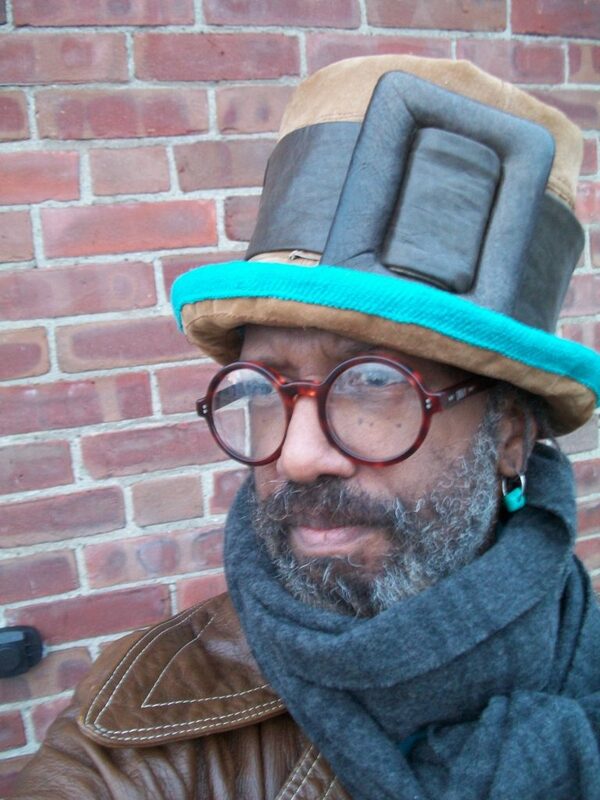 There, we chatted about Haiti, the Negritude Poets (whom inspired his name change), racial histories, the art of making hats, and the persistence of stars. When and how did your love for poetry first blossom? My mother has always been a big fan of poetry — of African American poetry mostly, but from Africa and the Caribbean, too. Definitely the Harlem Renaissance poets. Langston Hughes was the first poet I read in elementary school; his work really resonated with me. Also, the Latin American writers, like Gabriel García Márquez, and their magical realism. Poetry, even at an early age, presented this other dimension to me. Especially as a kid, where almost all forms of writing we’ve been exposed to are just writing assignments for class. Nothing too artful, just reports. I had associated writing with drudgery and red ink. Suddenly, I was presented with this form of writing called poetry, an art form that was free. You can write as you choose. No one can put any red ink on it. That was my epiphany. Haiti has played a big factor in your life. Why did you choose to move and live there for three years? I’ve done a bit of family research on my father’s side. It’s thought that his family may have been Haitian early on. For school, I went to Grambling State University, one of the historic black colleges in Louisiana, partly because of my interest in Haiti and the Caribbean. I’ve had a strong interest in the African roots of the Caribbean since elementary school. New Orleans was obviously a fascination of mine, what with its Creole culture. I was there at Grambling State for two years as a journalism major, since they had no poetry major. It was the next best writing program. It’s a good practical thing to fall back on — journalism. Of course, I’m not using it at all now in the café [laughs]. When I went to Haiti, I had little experience being outside the country. I was nineteen years old, and dropped out of college to move there. It was one of those headstrong had-to-do-this moments. I knew no one in Haiti. I was vulnerable. I probably could have been abused thirty-thousand different ways. But somehow, I just had a good feeling about this decision. I was always a big researcher. As a kid, my parents had a lot of encyclopedias. Encyclopedias and atlases were my dream vacation books. Places I had no hopes of ever seeing, I could read all about them. I scoured every book on Haiti and did all this research on the Creole language, so I had a good perspective when I got there. Luckily, my mother knew a Haitian woman — a doctor at University of Alabama — who connected me with people back in Haiti. When I got to Port-au-Prince, I had an address of someone’s home I could go to. In two weeks, I had a job teaching English at an adult English language school. I found an apartment in the “wealthy” side of town. It was thirty-five dollars a month. I was making five-hundred a month. Ratio wise, it was the most disposable income I’ve ever had. In your own words, how would you describe what the Negritude Poets Movement is about and how do you see yourself and your love of researching your family’s history fitting into that? Here’s the basic concept: At the turn of the twentieth century and the early years following, Haitian poets, having already successfully revolted against the French and winning their independence from slavery a hundred years prior, still found the bounds of their literature totally authorized by French (a.k.a. 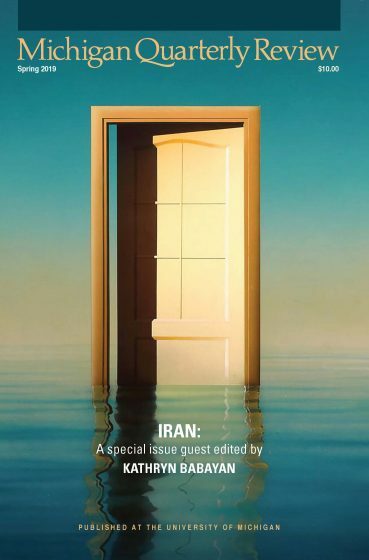 white) concepts, French editors, publishers, etc. So, however French-speaking Haitian writers were and still are today, with the same calls for independent liberation as Haiti’s Revolution against the French, a movement of Haitian poets, writers, musicians, dancers, painters, and artists culturally rebelled against this non-Black classical French paradigm (which spoke nothing to their voices as members of the western African Diaspora). They soon began voicing expressions of their own Afro-Haitian Creole experience, particularly in their own Creole language — a rich hybrid of various African languages, some French, English, Spanish, and Taino words (from the indigenous Taino people of Haiti). The Negritude Poets, coinciding with the same movement of the Harlem Renaissance in the U.S., blossomed to a full spiritual outpouring of their own lives, images, experiences, and beliefs. Of the many African survivals that are retained in Haiti, strongest among them is in their use of Voodoo to spiritually guide their voices, a dear means of spiritual expression shared by folks of African decent throughout the Americas, from Brazil to Nova Scotia. Thus, the abbreviated “St.” for “Saint” heading my last name. My first name “Toussaint” also recalls the name of the leader of the Haitian independence, Toussaint L’Ouverture. My own discovery of the Negritude Poets, and certainly the Harlem Renaissance, immeasurably continues to inform my own journey as an artist, past through future paths. Did you already know about the Negritude Poetry Movement before you arrived in Haiti? How did living in Haiti affect your poetry? No, I think I found out about the Negritude Poets after I got there. The thing that was so phenomenal were all these campaigns for Haitian arts. It’s an extremely artistic country. It’s amazing because Haiti has this awful legacy of being the most illiterate country in the Western Hemisphere, yet it has produced so many profound prize-winning writers. I think the paradox ties into the country’s history, being both brilliant and condemned. Because their kicking out the French and salvaging their freedom was so successful, there were laws in the United States that prohibited Haitians from entering America, because they didn’t want Haitians teaching Americans how to revolt—white and black Americans. You could not be seen talking to a Haitian in America. People didn’t want Haitians teaching liberation to the rest of the world. All of those blockades from first-world countries left Haiti without infrastructure, without tools, without hospitals and schools. Here’s your freedom, but you’re on your own. Learning about that history was how I was introduced to the Negritude Poets. Separate to that, at age nineteen, I had never heard of magical realism or surrealism — I only knew Salvador Dalí. All Haitian artwork — of all genres — is openly surrealist. I’m a big fan of your poem, “Out in My Yard,” which tells of a man who possesses all the stars in the sky, despite being impoverished by societal measures. It is a lovely poem bursting with magical realism! That’s how Haitians think in a surrealistic way. To be able to see beyond the current situation is a tool that has helped them survive poverty and very dark circumstances. Could you tell me a little more about that poem, “Out in My Yard”? I wrote it in Maine while serving as Belfast Poet Laureate. I lived in a tiny ten-by-ten foot cabin, owned by a friend of a friend. It was a free cabin in the woods, randomly offered to anyone who needed a place to stay. At that time, I needed a place to stay. I stayed there for about a year. It was actually very nice. There was no running water, but it had lights and electricity. One night, I walked outside and was looking at the stars. I was a little depressed. I wasn’t finding any work. The only thing worse about having a free place to live is not having any money. I didn’t have gas to go to the grocery store, I didn’t have money to buy groceries. I’m sitting out on the porch looking at the stars. And I thought, ‘Look, I may not have more than one zillionth of an acre, but look at these stars. I have all these stars.’ I really liked that. I’ve realized the universe … life … is always bigger than you. Bigger than anything that might be around you. Poster for a Jaguar Stereo show. You perform your poetry set to your own composed jazz music. I typically see music and poetry as two separate things, but when you perform them, it feels like they really do belong together. With Jaguar Stereo — this latest thing I’ve done with poetry and music — I’m so thrilled to see how the poetry and the music has evolved together, but mostly that I’ve found a community of people that appreciate it. I’ve been performing poetry since I was in high school. I’m fifty-eight now. For a majority of those years, I was grateful for an audience of five people, and whatever I did, it was always weird. In my generation, and perhaps all since, poetry was never a cool thing, nothing the cool kids did, it was never hip. I mean, it was in my personal world. I think it’s extremely hip. But in 1980s San Francisco, Madonna — now she was hip. If I asked friends to come hear me lip sync Madonna, maybe then I could get people to show up, but to come hear poems? Not a big seller. I didn’t take up an instrument until my early thirties, but I had developed a delivery with my poetry that was very musical. I’m completely self-taught in pretty much every creative thing I’ve ever done. So as far as the musical part, in the early years, I was a little unsure of my playing because it wasn’t with anyone’s approval. I wasn’t trained in any musical way. One day, I decided I’m going to start musically expressing this poem, assuming that it was off-key and everyone was just putting up with my craziness. That was my take on it. Do you presently write your poetry with your delivery in mind? What’s your process of translating a poem from page to voice? Usually, when I write, it’s just the power of the poem itself on the page. During the writing process, I might hear a certain tonality or cadence. I use a lot of repetition in my delivery, but the repetition is not necessarily written on the page. The oral repetition comes out of the African American gospel and traditional ministers, like in Martin Luther King’s speeches. I did not grow up church-going or in a traditional Christian household in San Francisco. I’m very spiritual; I have a very spiritual appreciation for life, but it’s not tied to a religion. At the same time, I can appreciate other people’s cultural traditions. When I would visit baptist relatives in Alabama, all those visits going to church with relatives, one thing I really appreciated was the oral delivery. I understood the repetition as a tool for getting your attention or for emphasis. In Haitian Creole, repetition is used in regular dialogue. Instead of saying “I am very hungry,” they’d say “I am hungry hungry.” That’s how I use it, too. It’s percussive. I’ve come to realize as Americans — especially after the last fifty years of generations with television, headphones, all the ways we’ve learned to block out communication — we’ve developed a really bad case of selective hearing, especially when it comes to things that are critical of us. Or things that might make us uncomfortable, that we might not want to deal with. We zone out, “Oh I didn’t hear that.” So I use repetition to nail certain points home. I was in this class during my undergraduate years at University of Michigan — a graphic novel/comics class. In it, we studied the form. My professor said that when you put pictures and words together, it creates this “third thing”: something in between those two genres that didn’t exist before you put them together. I was thinking about the rhythm of your music and the meanings and repeating patterns of your words. When you put those two together, what do you think that “third thing” is that you’re creating? That’s interesting. I don’t know if there’s a single word for it. I’m a poet and I’m a musician. I write words and I write music. Whether you are writing notes on a page or words on a page, whether you are using the same hand, same pen, both are forms of writing. I’m also a hat maker. I’ve been making hats for decades. Hats are my form of sculpture, my 3D visual art form. I realized after years, whether it’s making a hat or writing a poem or making a song, all three of those often come from a particular experience. I find that when I’m playing the horn, I’m using the same voice I use when I’m reciting a poem or I’m using the same voice metaphorically when I make a hat. For me, a hat is a poem is a song; a song is a poem is a hat. They are interchangeable facets of the same diamond. What kind of hats do you make? They wouldn’t know the story behind it, you mean. Exactly. For me, it’s the same as if I had written a poem for my grandmother. That hat is a poem. They are all entwined. Speaking of hats, you have quite the great sense of clothing! I was wondering how you came to find such a unique style. I didn’t really think I had a style. It’s just me. It’s just me being me. I went through periods in my teens and twenties, when being me clearly did not fit in. I’ve always been kind of odd. Always the odd person out, going back to my earliest memories. I remember adolescence and early adulthood, not wanting to be a freak. Eventually I got to the point where I thought, No, I like being myself. Eventually, it dawned on me that we are who we are, whether we accept it or the people next door accept it. You can mask it however you want; you can wear certain clothing to fit in. But a zebra who tries to dress like a giraffe is always going to be a zebra dressed like a giraffe. No one’s ever going to be fooled. Especially not anyone else. You might fool yourself, though. That was a powerful lesson for me, especially dealing with racism. My mother has always been proudly black, very much into African and African American heritage. My father’s family being from the north, he was from a generation where the best way to survive as a “proper” African American was to assimilate into white culture as much as you could. Talk like white people. Eat white food. Listen to classical music…anything associated with white culture. If you secretly loved Duke Ellington or Billie Holliday, you hid it. In the North, people would have these behind-closed-door Black Parties, where you’d go to someone’s house, draw the blinds, and listen to blues or jazz. Then you’d go back into Manhattan and try your best to be white. I came to a conclusion early on: What am I going to do in this country I live in? I am black. I live in a world where a lot of people hate black people. We have to function together. We have to get jobs together. I can get mad about the racism and boohoo and crawl up into a fetal position and lie on my floor. Well, that’s just going to get me evicted, because I won’t be earning a living. So, you have to figure out how to deal with life. The only alternative that anyone has is to be themselves and be a good person. If you have a skill to offer, just try to find that one employer who wants to hire yourself or that skill of yours. The best thing any of us can do is to be ourselves. This sounds like a Hallmark card, but I think that if more of us started being ourselves, it would get rid of a zillion problems. from seeing all your storms. from your gilding of thorns. I wrote that when I was in Maine, too. One thing I discovered about Maine is that I couldn’t find anyone to hire me. It was far more racist [than Vermont]. I wrote that poem one day, as a pep talk to myself. I thought, Okay, you can stop me from renting that apartment, you can stop me from earning an income, but you can’t stop me from being me. Even if you shoot me dead in the street, you can’t take the fact that I still exist. That seems like such a take-for-granted sort of thing. I always read that poem to send the message to everyone. I work in the cafe now, but I’ve worked in so many jobs — in the financial district, in office buildings, in customer service — and I’ve worked with people who so hate what they do and they feel so dejected and demeaned. I have those lows, too. The working life can be really demeaning sometimes. But I want to preach the message that no matter what our circumstances are, no matter how poor we may be — and Vermont is largely poor — you always have yourself. Growing up in San Francisco, it has always been full of movements. Gay Rights. Black Panthers. One movement in the 1980s and 90s was about self-empowerment. It was all about owning everything about your life. Own your talents. Don’t let other people, whether it’s your partner or your family or an institution, don’t let outside entities control your happiness. Own your happiness. Own your name. Own your writing. Own your music. Own yourself. Find out more about Toussaint St. Negritude’s work at toussaintstnegritude.tumblr.com.